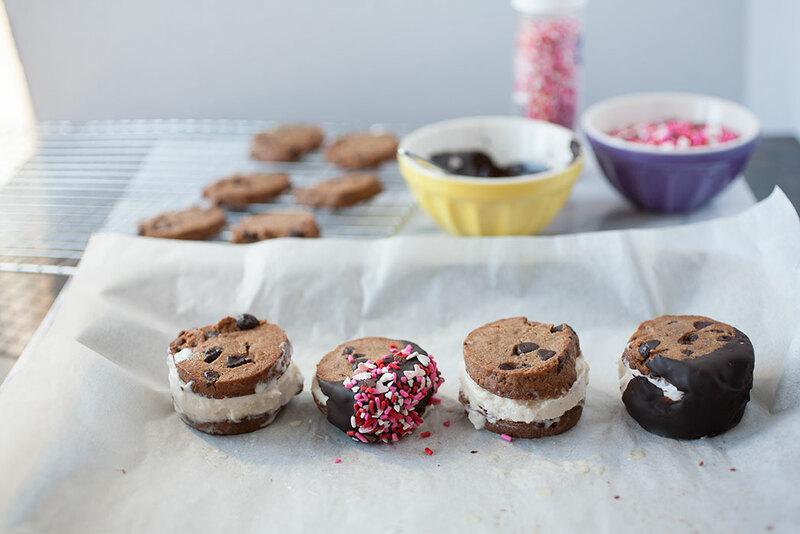 I’m all about quick and easy here on Flurries of Flour, and this recipe for homemade ice cream sandwiches is a quick and easy recipe that gives you a fun, sweet and delightful dessert that belies its simplicity. 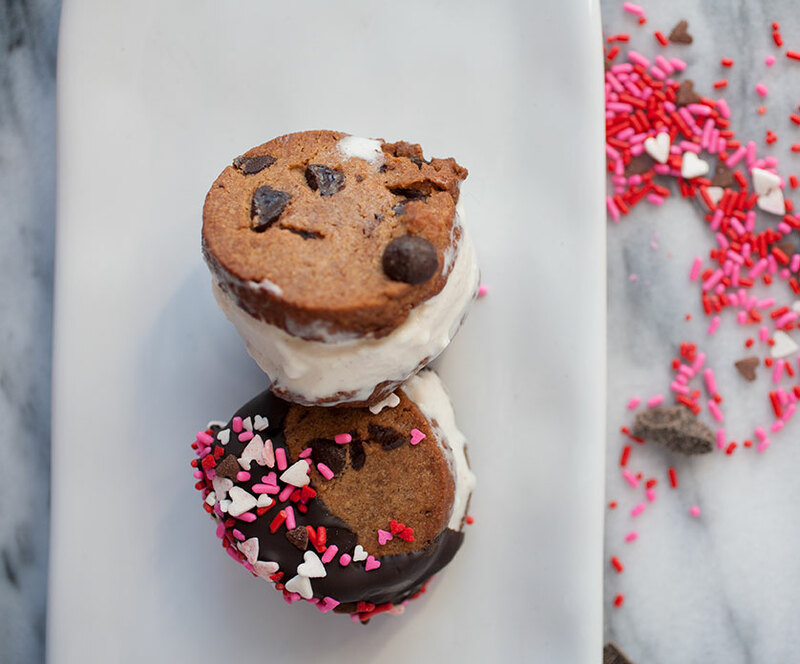 It makes a perfect special treat for special occasions or holidays like Valentine’s Day, and you the best part is that you can make them any way you want! Just start with the basic recipe and go from there! Plus, you can make these gluten-free, dairy-free, paleo—it’s up to you! I know, this is not a ground-breaking recipe. But here on this blog, I’m all about quick, easy, delicious and healthy recipes, and this checks (almost) all of those boxes! I love the idea of spending hours in the kitchen, working to make something special, especially for special occasions like Valentine’s Day. But, honestly, I rarely have time for that. With everything I have to do every day and week and month, I usually only have time for the same quick, easy, and simple dishes that I post here—meals done in less than an hour that are also healthy—or are fun dishes that may not be quite as healthy but are still done in a shorter amount of time. This is one of those latter recipes. Whether you bake your own cookies or get cookies from a roll (or buy already-baked cookies), this recipe gives you a special, absolutely delicious dessert you can play with to your heart’s content! 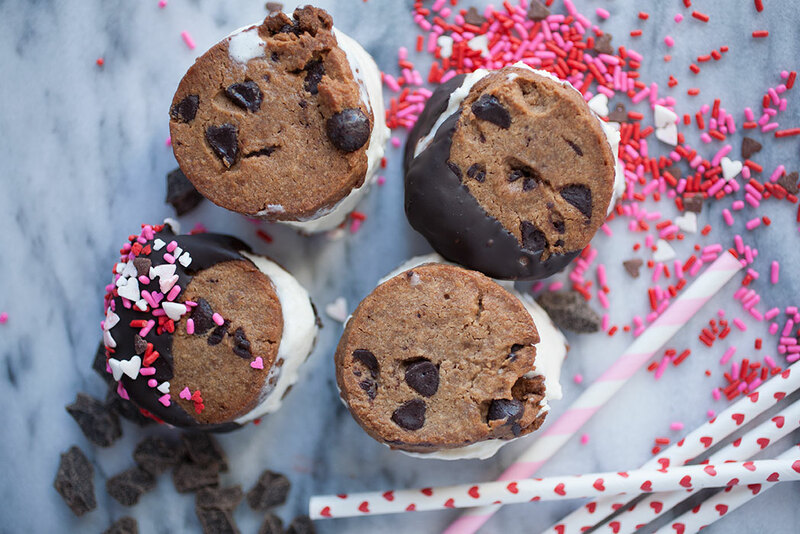 You can use any type of cookie, any type of ice cream, and any type of topping (or mix in!). For the sandwiches pictured in this blog, I used the traditional chocolate chip cookie (from a paleo refrigerated bake-it-yourself roll) and regular vanilla gelato (the gelato was on sale…). But what about a double chocolate cookie and strawberry ice cream? Or a snickerdoodle with coffee-flavored ice cream? A gingerbread cookie with pumpkin ice cream? Dip them in chocolate like I did here or in white chocolate or drizzle with ganache or crushed Oreos or even cereal… you get the idea. A few notes: when you take out the ice cream to soften so you can scoop it, start scooping as soon as you can force a spoon in there. If the ice cream gets too soft, it will run all over the cookies and your hand and then will run out of the cookies as soon as you put them in the freezer and you’ll just end up with two cookies pressed together. 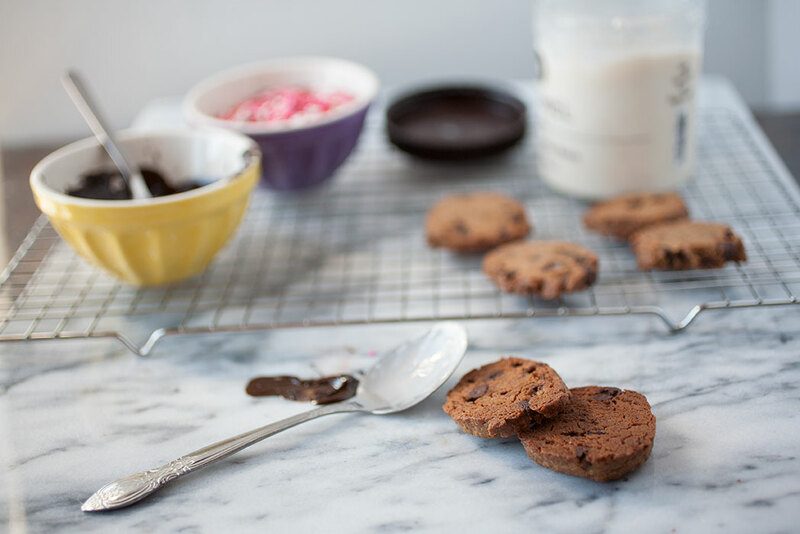 Also, you’ll have to work in batches, depending on how many cookies you’re making and what you’re dipping them in to. In fact, as soon as I dipped the cookies into the chocolate and sprinkles, I put each one right back into the freezer, taking them out and putting them back on at a time. It’s a simple recipe, but kind of messy. Bake your cookies and allow to cool. Prepare a sheet pan by lining it with paper or Silpat, then take out your ice cream and let it melt until you can just scoop it out. Spread the ice cream over one cookie, then gently press the second cookie over the top and place it in the freezer. You can clean up the edges if you’d like. Then place on the sheet pan in the freezer to set. Let the sandwich sit for at least two hours before serving or decorating. If you’d like to dip the sandwiches in chocolate, melt half a cup of chocolate chips by microwaving for 30-second intervals in the microwave, stirring between sessions, until fully melted. Take one ice cream sandwich out of the freezer at a time and dunk it quickly into the chocolate. Roll (very) quickly in any other toppings and place back into the freezer to set. And that’s it! 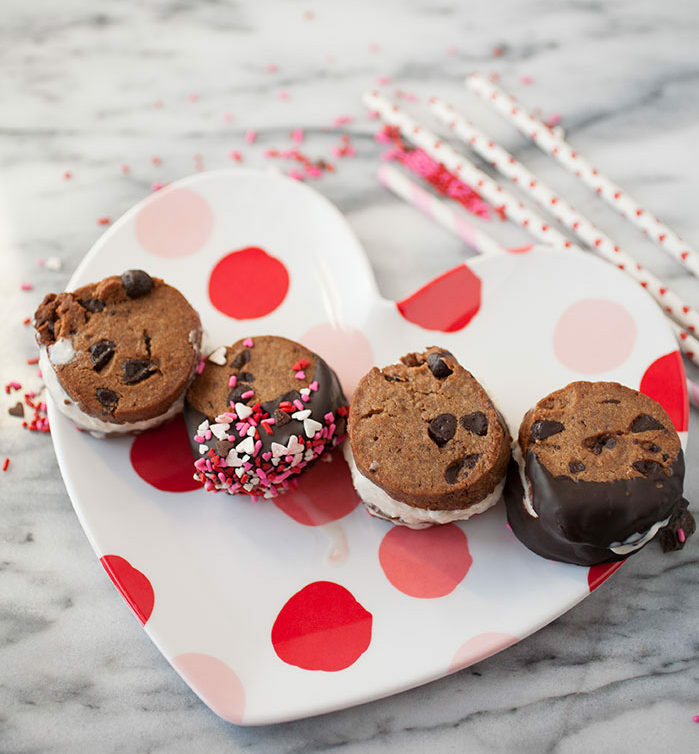 Perfect for a special Valentine’s Day (or any other day) dessert!